Unfortunately, fans of the 82-year-old tavern on Fairfax are all too familiar with Tom Bergin’s beleaguered saga. In 2013, the bar briefly closed after its previous ownership—chef Brandon Boudet and restaurateur Warner Ebbink—decided to shutter the business following a costly renovation and flagging sales. That same year, Schreck—a bar regular and ardent preservationist—stepped in as owner, pledging to preserve the historic décor and the 6,000 or so inscribed cardboard shamrocks that lined the ceilings. It appeared that Tom Bergin’s had finally been saved. 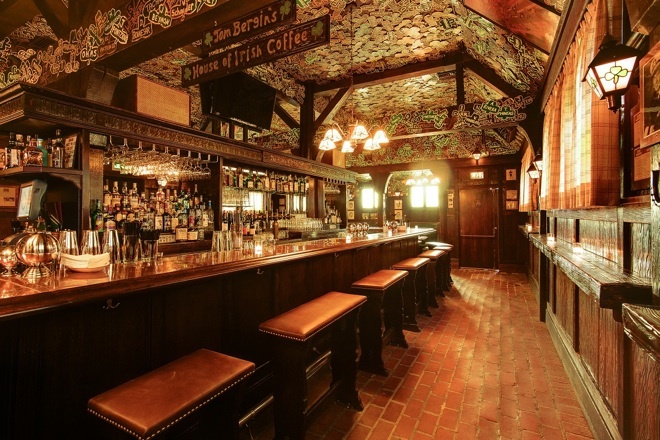 True to his word, Schreck maintained the moody ambiance of the horseshoe-shaped bar, pouring pints of Guinness and cream-topped Irish coffees (the pub’s signature drink) amid the worn oak furniture, polished brass rails, and stained glass windows that lined the room. Nearly five years later, Tom Bergin’s finds itself in similarly dire predicament. If an earnestly committed owner was unable to keep the tavern’s traditions alive, can anyone? Until that question can be answered, you’ll find us raising one last pint at the bar, the same one that has been a St. Patrick’s Day destination for drinkers since 1936.